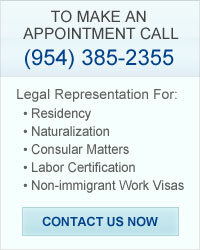 The firm counsels individuals and businesses on immigration-related hiring practices and employer sanctions; assists clients with immigration strategies related to corporate structuring and investment; represents clients with nonimmigrant work visas; advises on educational and training visas; assists with consular matters; represents clients regarding labor certification, residency, naturalization, and appeals of adverse decisions. We accomplish our mission by providing specialized care to each client. We know that immigration issues can chart the trajectory for a family's and company's future. For that reason, we take the time to understand the complexities involved and provide tailor advice to the specific situation. The mission of our firm is to provide legal counseling and coaching to high net worth clients regarding their immigration and corporate structure and life issues. © The Law Office of Jeffrey E. Campion, P.A.